September 4, 2016 By Allyson Leave a Comment This post may contain affiliate links. Read my disclosure policy. 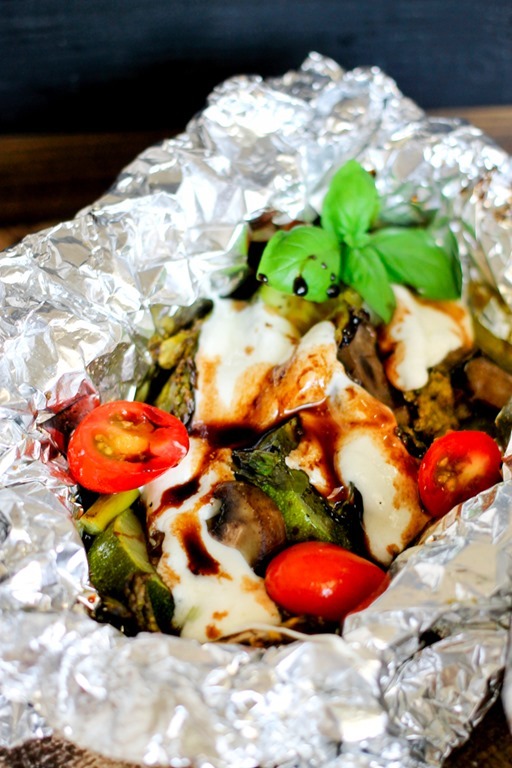 Vegetable Caprese Foil Grill Packs – fresh vegetables topped with fresh mozzarella and a delicious balsamic glaze – healthy and so delicious! Even though summer is starting to wind down, I always try to make an effort to keep grilling outside to make the most of grill season. 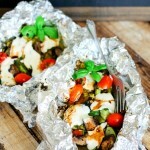 I was making some various foil packs a few weeks ago, when I had the best idea ever – Vegetable Caprese Foil Grill Packs – how amazing would those be?!? 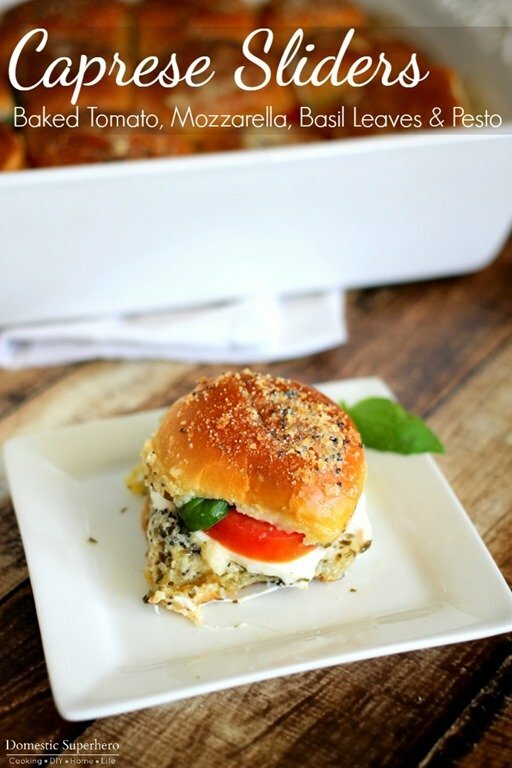 Filled with fresh garden veggies, pesto, basil, tomatoes, fresh mozzarella, and then topped with a balsamic glaze?!?! Yes, yes, yes! The only thing standing in my way now that fall is rolling in, is my darn allergies starting to bother me every time I go outside. That’s why I was super happy to team up with Puff’s on this post; this post is sponsored, but all opinions are my own. 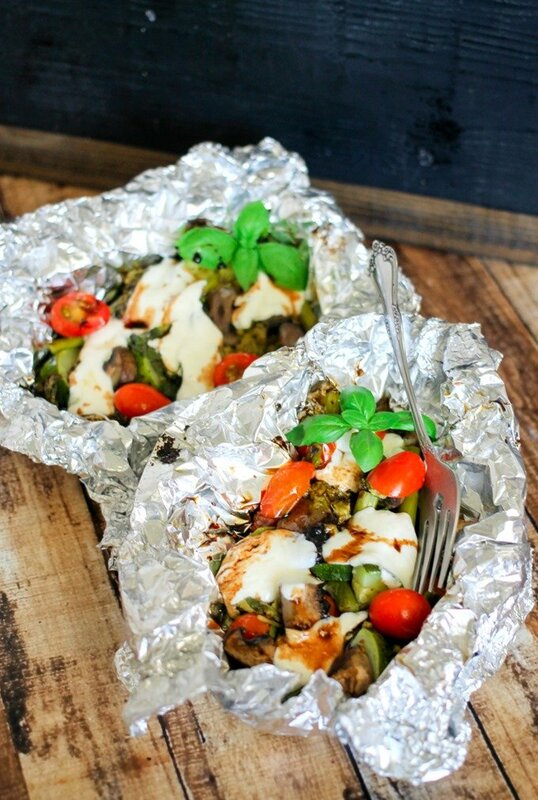 Let me start off by saying, these Vegetable Caprese Foil Grill Packs are seriously the EASIETS recipe you will ever make! That is why I push myself to keep grilling, even when my allergies are flaring up. I love picking the fresh vegetables from my garden, but when my nose starts getting stuffed up and running, that does not make for fun cooking! That’s why I always bring a box of Puff’s Plus Lotion Tissues with me outside when I am outside in the yard! They now come in a convenient 10 pack from Sam’s Club, which makes it really easy for me to stock up for fall’s allergy season! 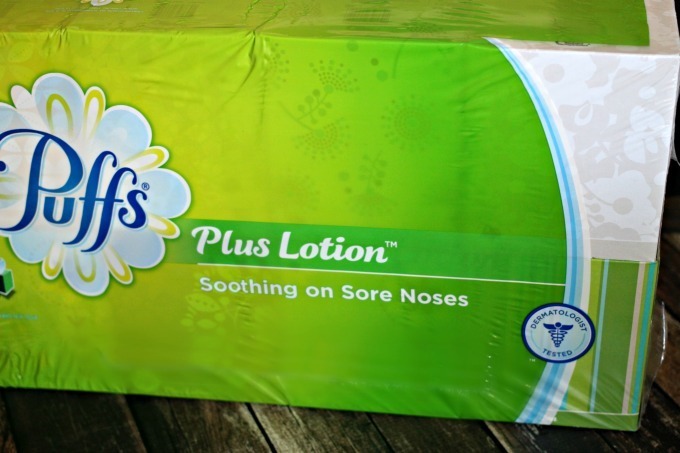 Puff’s Plus Lotion is America’s #1 lotion tissue, and is dermatologist tested to be gentle on sensitive skin. When I use Puff’s, I don’t have to worry about my skin breaking out or anything nasty on my face! 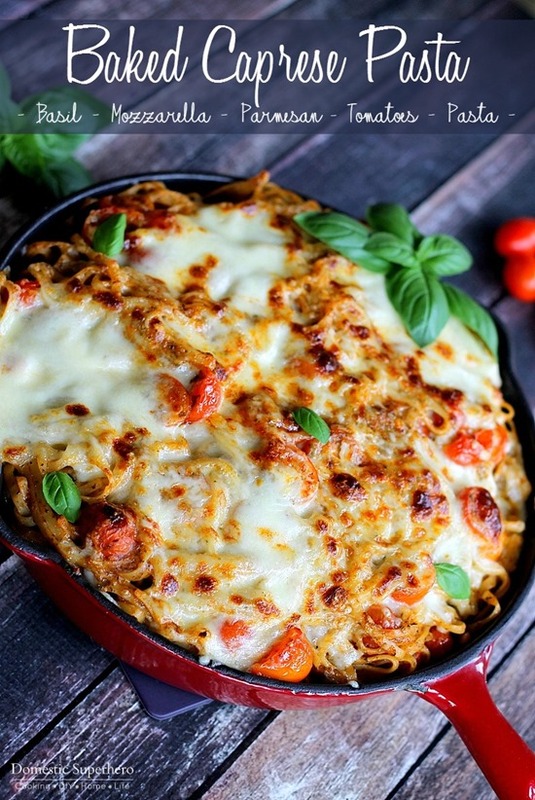 Plus, as a food blogger, I am cooking 24/7 and I need something that is easy to grab and go. I like to bring these individual boxes around the kitchen and even outside to the grill with me. Making these Caprese Foil Grill Packs only takes a few minutes, and they are a delicious healthy meal that you can feel good about eating! You could easily wrap this deliciousness up in a pita pocket, throw it on top of a naan flatbread, or just eat it straight out of the foil pack, which is what I like to do! You really can’t go wrong regardless of how you decide to serve and eat them! Vegetable Caprese Foil Grill Packs - fresh vegetables topped with fresh mozzarella and a delicious balsamic glaze - healthy and so delicious! Lay 2 heavy duty pieces of foil on top of each other (should be 12 inches each), repeat for second pack. Distribute all vegetables between 2 packs as evenly as possible. 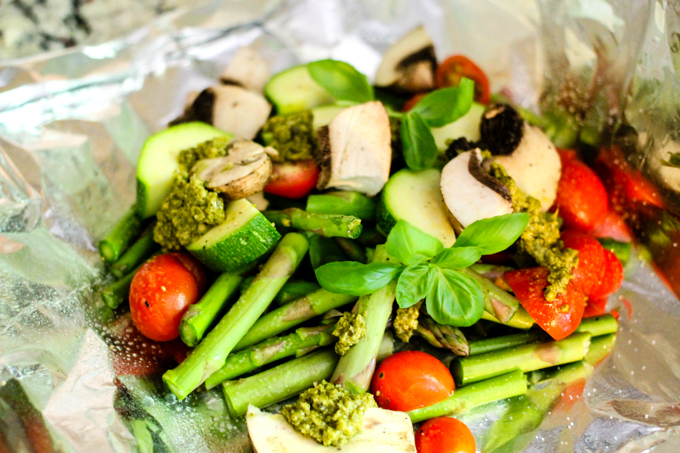 Top each pack with 1 TBS fresh pesto and a dash of salt and pepper. Hold the two long edges of foil and bring together in the center above the food.Fold edges down creating a small lip – about 1/2 inch along the entire length of the foil. 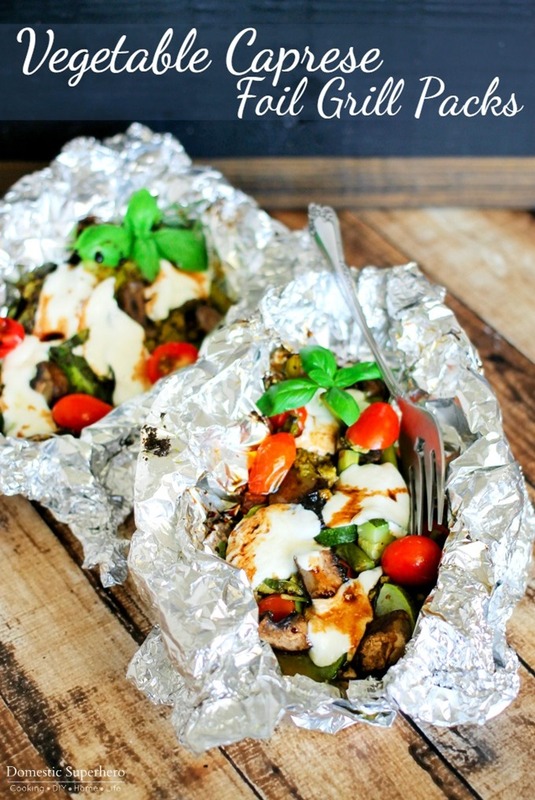 Make to sure there is room between the food and the foil so heat can build up inside the packet. Fold lip over once more so it lays flat on top of the foil pouch. The top of the foil pouch should be nicely sealed now leaving two open “short” edges. Press short edges together and fold over once to create another 1/2 inch lip. Make sure there is plenty of extra room from the edge of the foil to the contents of the foil packet (1 ½ to 2 inches). Fold lip over once more so it lays flat on top of the foil pouch. Your foil packet should be tightly sealed on all sides and stay closed when you handle it. Make sure the food has room inside the packet though, making it too tight will make it so the food does not cook well. Place packets onto grill, and close lid of grill. Cook for 4-5 minutes. 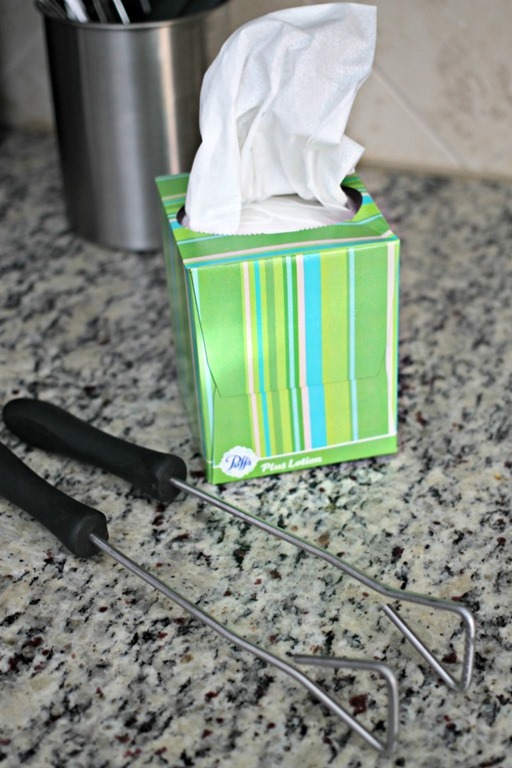 Using tongs or your hands (WITH A OVEN MIT ON), shake the packet around a bit. Close the lid and cook 2-3 more minutes. Carefully remove from grill, and set aside. Using an oven mitt, carefully open the pack, and lay your cheese on top, and the fresh basil leaves. Loosely close the pack back up, and leave for 1-2 minutes, allowing the cheese to melt. For the glaze (this can be made while your packs are grilling): Add balsamic vinegar and sugar to a small sauce pan; whisk until combined. Bring to a boil, then whisk, reduce heat to a strong simmer, and cook simmering for about 5 minutes. Remove from heat, let cook for a few minutes (mixture will thicken). Drizzle the glaze over the top of the vegetable packets once the cheese is melted. Enjoy!